Valentine’s Day can be stressful and finding the perfect gift for your significant other is always a difficult choice. From trendy tech items to a coveted reservation at the finest restaurant in town, it seems like we’ve forgotten what Valentine’s Day is about. Remind your loved ones how much you love them and take the pressure off of this year with a special and meaningful gift idea. 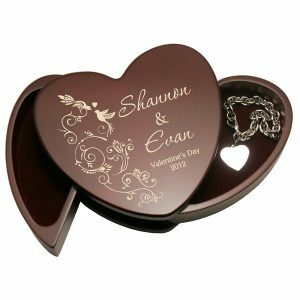 This unique heart shaped rosewood jewelry box is the perfect Valentine’s Day gift! 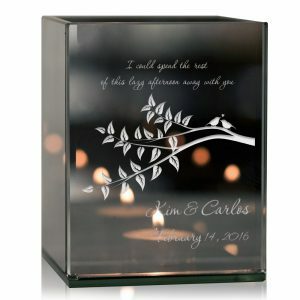 The couples names and a special message is adorned with love birds and embellishment to truly make this a special design. The sides of the heart open up like wings as storage areas as well as to symbolize an open heart! This is a gift she will treasure forever! Try a modern spin on the classic carved initials into a tree, with this unique wall canvas! 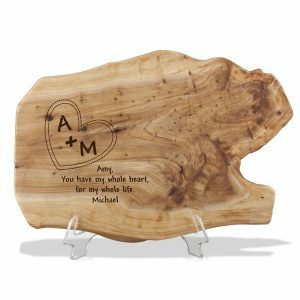 Designed with a carved heart featuring the couples names and special date, this is the perfect gift for your significant other or that special couple! A small but mighty gesture for your loved one is a small keepsake box. Perfect size to fit small jewelry and keepsakes – an added extra surprise, fill it will a nice pair of earrings or a promise ring to really make it special! 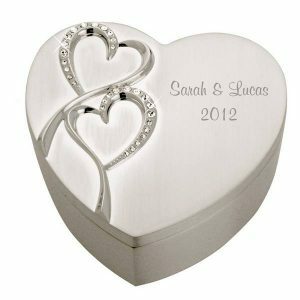 Engraved with your names and a special date, this box is something she will treasure forever! Light up your home with warmth and love with this special tea-light candle holder. Perfect for that special couple that seems to light up each other’s lives! Adorned with two love birds sitting together on a branch and a special message, this is sure to warm their hearts! Add their names and a special date to make it even more meaningful! 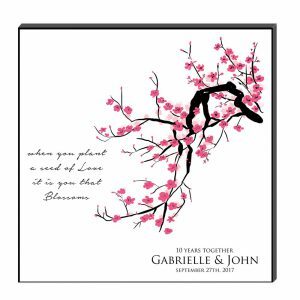 You can wake up to beautiful cherry blossoms every morning with this special cherry blossom wall art. Each cherry blossom is unique just like you and your significant other and the love you share! Perfect for that couple that just seems to have it all! 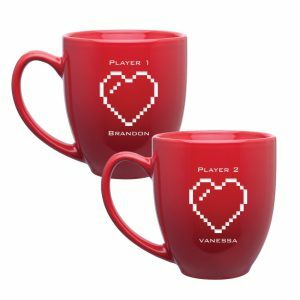 Start your mornings together in style with cute 8-bit heart personalized mug set. Personalize Player 1 and Player 2 with the couple’s names to celebrate their relationship and shared hobbies! Microwavable and dishwasher safe, this set is sure to be used every morning! 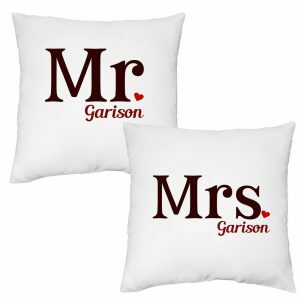 Perfect for the newlywed couple to revel in their new shared surname! Featuring burgundy lettering and a bright red heart accent, this set is perfect for the Valentine’s season and is modern enough to be displayed year round. Help them decorate their new shared space with a fun pillow case! Every young couple wants to carve their love out on a tree, an age old tradition! Take a super modern spin on that tradition with this carved heart wood plaque. 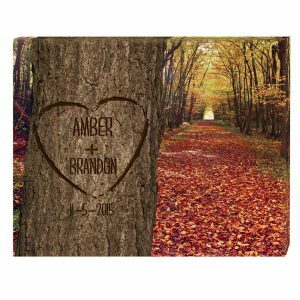 Engraved on a piece of natural wood are the couple’s initials and a sweet message. Perfect for couple’s young and old to celebrate their timeless love! Sometimes big gifts come in small packages and the best gifts are not always the biggest! 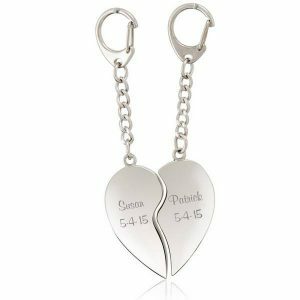 This magnetic heart key chain is perfect for couples that are far apart. 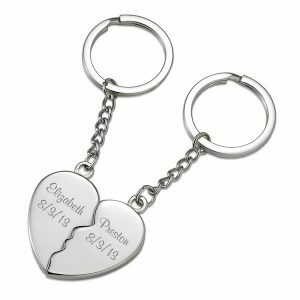 Remember the love you share with this special key chain and add your names and special date to make it even more special! Keep your other half close at all times with this unique heart shaped key chain! Perfect for the couple that seemed to be inseparable from the start! This treasure box is adorned with hearts and sweet sayings around a photo of the couple. This keepsake box is the perfect size to hold small trinkets, photos, tickets and letters. This year, go back to the real meaning of Valentine’s day and celebrate the relationships and people that you love. Take the pressure of getting the most expensive, nicest gift off with a gift from our Valentines Day Gift Guide. A personalized gift from our list is sure to impress and be used and cherished for years to come!